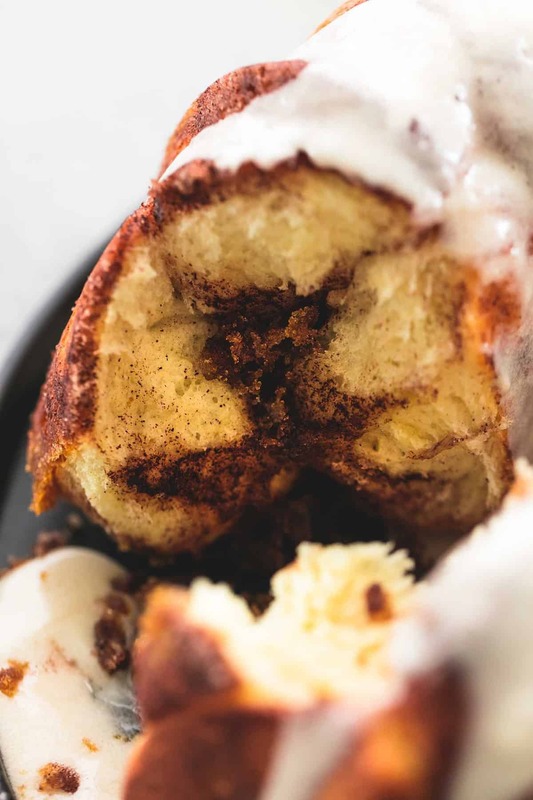 This sweet and indulgent Cinnamon Swirl Monkey Bread is easy to make and fun to eat! Drizzle cream cheese vanilla glaze on top for a cinnamon roll twist on a classic dessert! 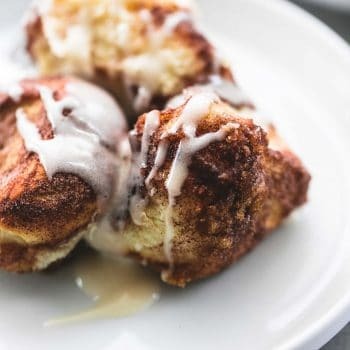 Cinnamon rolls are continuously on the trend! Try Apple Pie Cinnamon Rolls, Pumpkin Pie Cinnamon Rolls, One Hour Cream Cheese Cinnamon Rolls, and Cinnamon Pecan Coffee Cake. This post is sponsored by Fleischmann’s® Yeast. All opinions are my own. It’s that time of year again when I’m thinking about our holiday menu and trying to whittle down what I might make for THE meal. No not the Thanksgiving feast, and not Christmas dinner either. Don’t misunderstand me, I have a special corner of my heart reserved for those two, trust me. Because if cranberry salad and sweet potato casserole are involved, count. me. in. But right now I’m referring to my personal favorite, Christmas morning breakfast. Christmas morning breakfast sets the tone for the whole day, and each year I carefully weigh the many delicious options before selecting what I’ll be making, and serving my family when the big day rolls around and you better believe this year Cinnamon Swirl Monkey Bread is right at the top of my list. Easy – like sooooo easy – it’s Christmas after all, I don’t want to be stressed about breakfast. Kid-friendly – the last thing I want is to be battling with my picky eaters on Christmas morning. 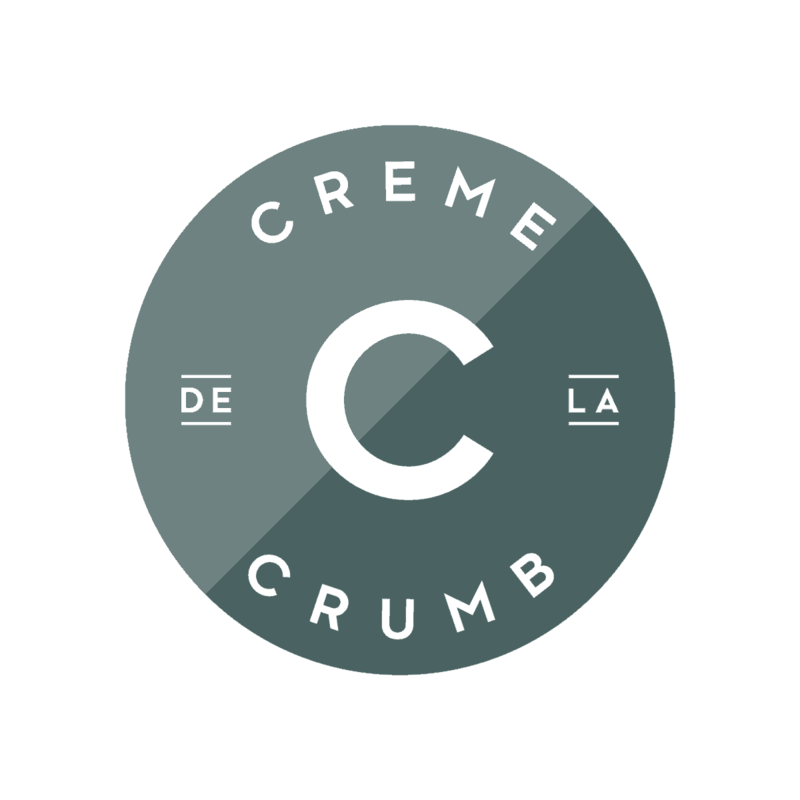 Involves cinnamon – as far as I’m concerned if it doesn’t call for a hearty amount of cinnamon, it’s not Christmas-worthy! You’ll notice I put Easy at the top of that must-have list. 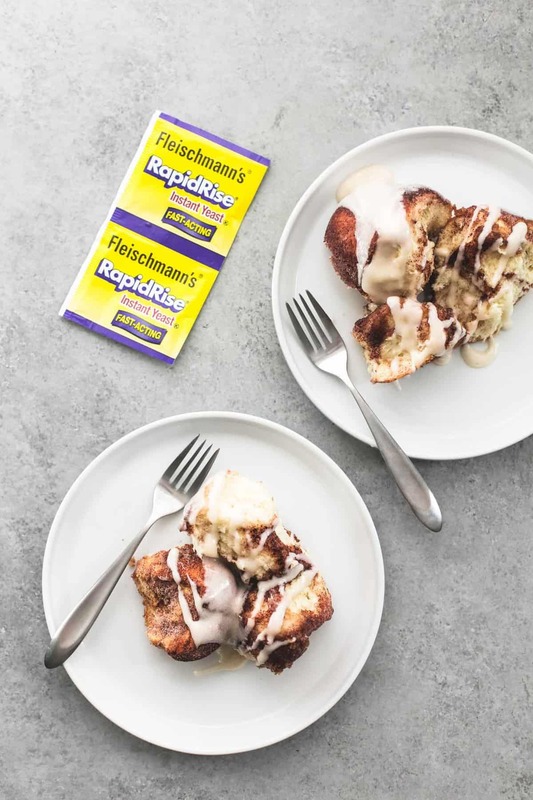 Fleischmann’s® RapidRise Yeast is the key to whipping up these fluffy, doughy, cinnamon-y monkey bread morsels with as few steps and as little prep time as possible. Last week I let my toddlers help me out on a test run for these babies and they came out perfect! 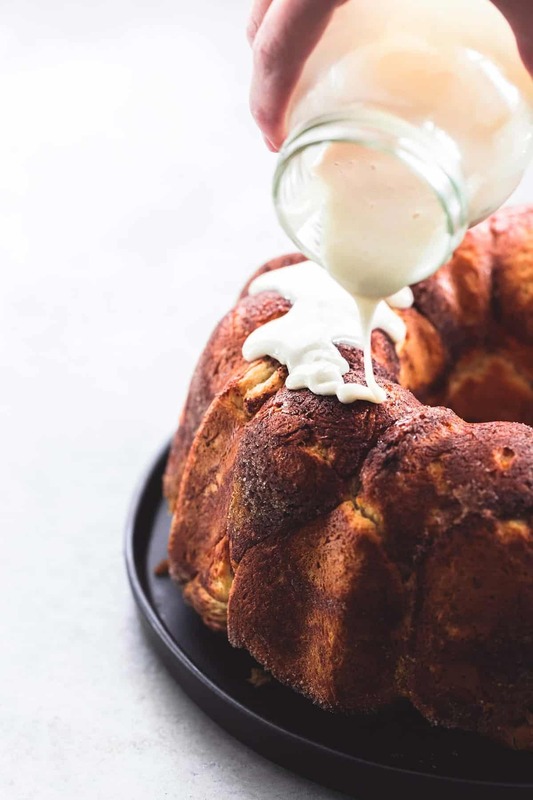 They helped add the yeast to the dough, roll it into balls, sprinkle the cinnamon sugar on, and of course they got a thrill out of drizzling that cream cheese glaze before shoveling warm monkey bread into their mouths as quickly as they could. 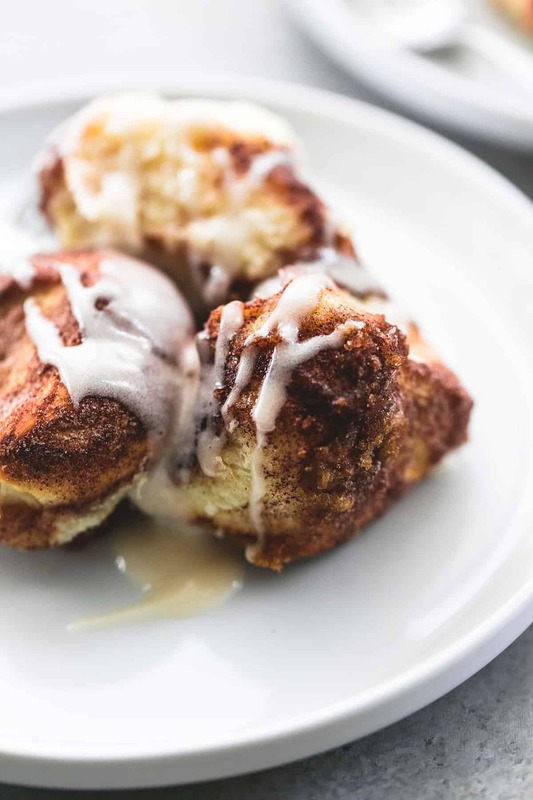 This Cinnamon Swirl Monkey Bread will please your entire family this season, whether it’s on Christmas morning for breakfast, or for dessert on a cozy Sunday night by the fireplace. 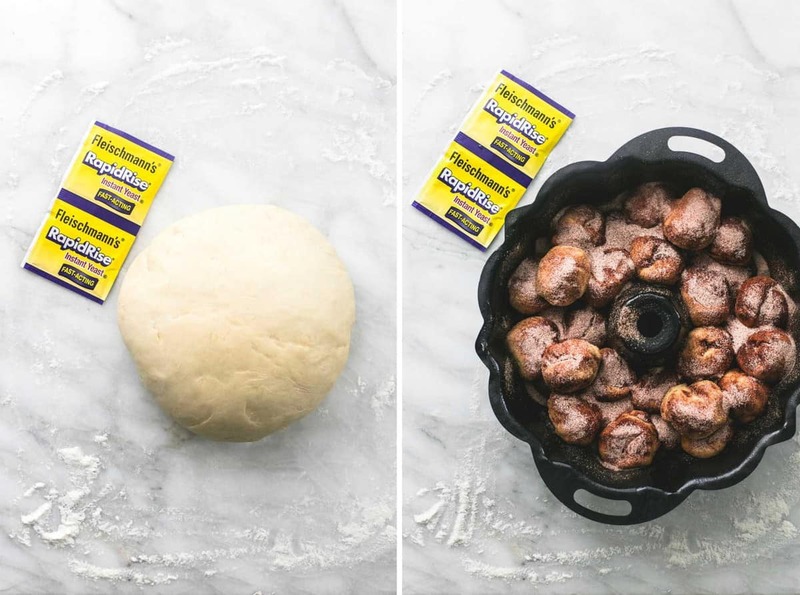 You will be amazed at how easy it is to make monkey bread from scratch when you use Fleischmann’s® RapidRise Yeast! Combine 2 cups flour, sugar, undissolved yeast and salt in a large mixing bowl. Heat water, milk and 5 tablespoons butter until very warm (120° to 130°F); stir into flour mixture. Stir in eggs and enough remaining flour to make soft dough. Knead on lightly floured surface until smooth and elastic, about 6 to 8 minutes. Cover; let rest on floured surface 10 minutes. Divide dough into 32 pieces; roll into balls. Melt remaining 3 tablespoons butter; dip balls in butter. Stir together sugar, cinnamon and brown sugar. Layer 1/3 of the cinnamon sugar mixture in the bottom of a greased bundt pan, then 1/2 of the dough balls, followed by another 1/3 of the cinnamon mixture, remaining dough balls, and lastly the remaining cinnamon mixture. Cover and let rise in warm, draft-free place until doubled in size, about 30 to 40 minutes. (To speed this up you can preheat the oven, then turn it off and set the covered bundt pan on the open door until doubled in size). Bake at 375°F for 30 to 35 minutes or until done, covering with foil during last 10 minutes to prevent excess browning. Let cool in pan on rack for 10 minutes. Invert onto serving plate and top with glaze. Cream together all glaze ingredients. As milk as needed to thin to pourable consistency. Pour over warm monkey bread and serve. There’s nothing as warm and cozy on Christmas morning as a “cinnamon and swirl” recipe. And I especially love your Cinnamon and Swirl monkey bread. I love how easy it is and how perfectly it sets the stage for a wonderful Christmas day! Thanks so much for the post! Can you cook this is something other than a bundt pan? I’m sure that you could but I do typically make monkey bread in a bundt pan. I haven’t made it anything else so I don’t have much advice yet! So on Christmas morning you are supposed to mix this, Make 32 Balls, let it rise 40 minutes and then bake? That’s a lot of time on a big day! is there a way to make this in advance and refrigerate it? Hi Lynn- I haven’t tested making the dough and then refrigerating it before baking.. so I can’t say for sure! Nothing better than cinnamon for the days to come 🙂 Thank you! Thank you so much for sharing the recipe! It looks so good!